Background and aim: Chronic psychological stress, including water avoidance stress (WAS), induces intestinal mucosal barrier dysfunction and impairs mucosal defences against luminal bacteria. The aim of this study was to determine the ability of a defined probiotic regimen to prevent WAS induced intestinal pathophysiology. Methods: Male rats were subjected to either WAS or sham stress for one hour per day for 10 consecutive days. Additional animals received seven days of Lactobacillus helveticus and L rhamnosus in the drinking water prior to stress and remained on these probiotics for the duration of the study. Rats were then sacrificed, intestinal segments assessed in Ussing chambers, and mesenteric lymph nodes cultured to determine bacterial translocation. Results: All animals remained healthy for the duration of the study. Chronic WAS induced excess ion secretion (elevated baseline short circuit current) and barrier dysfunction (increased conductance) in both the ileum and colon, associated with increased bacterial adhesion and penetration into surface epithelial cells. Approximately 70% of rats subjected to WAS had bacterial translocation to mesenteric lymph nodes while there was no bacterial translocation in controls. 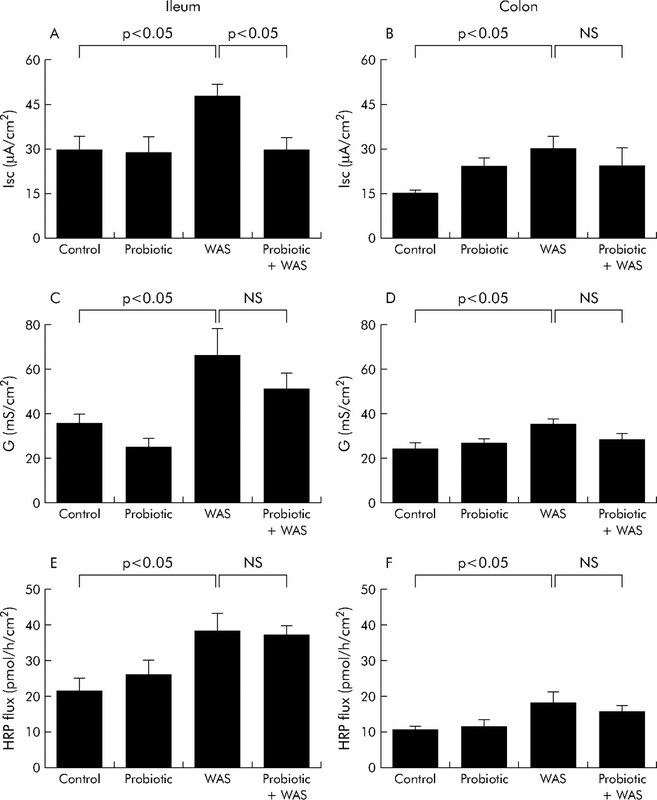 Probiotic pretreatment alone had no effect on intestinal barrier function. However, WAS induced increased ileal short circuit current was reduced with probiotics whereas there was no impact on altered conductance. Pretreatment of animals with probiotics also completely abrogated WAS induced bacterial adhesion and prevented translocation of bacteria to mesenteric lymph nodes. Conclusion: These findings indicate that probiotics can prevent chronic stress induced intestinal abnormalities and, thereby, exert beneficial effects in the intestinal tract. There has been substantial research focusing on modulation of the intestinal microbiota and host inflammatory responses by probiotic bacteria.1 Probiotics are defined as non-pathogenic live microorganisms that can have health benefits for the host.2,3 Such microorganisms have been used extensively for both the prevention and treatment of various inflammatory and infectious intestinal disorders, including inflammatory bowel disease,4,5 pouchitis,6 infectious diarrhoea in children,7 and in animal models of infectious gastrointestinal disorders.8,9 Although these studies demonstrate beneficial effects of probiotic therapy on inflammation and the prevention of attachment of pathogenic bacteria to host surfaces, it remains to be verified whether the beneficial effects of probiotics can be applied to other gut disorders in which intestinal barrier integrity is compromised. A commercially available probiotic powder containing live Lactobacillus rhamnosus, strain R0011 and Lactobacillus helveticus, strain R0052 (Lacidofil) was provided by Institut Rosell-Lallemand Inc. (Montreal, Quebec, Canada). The probiotic mixture was rehydrated to a concentration of 109 CFU/ml in sterile distilled water. Viability was confirmed by culturing 0.1 ml of the rehydrated mixture on de Mann Ragosa and Sharpe plates supplemented with colistin nalidixic acid (PML Microbiologicals, Missisauga, Ontario, Canada) at 37°C for 24 hours. Male Brown Norway rats (250–350 g) were obtained from a breeding colony at McMaster University (Hamilton, Ontario, Canada). Animals were individually housed and maintained on a 12:12 hour light-dark cycle under specific pathogen free conditions. One group was fed a standard diet and sterile drinking water throughout the study (basal diet) and the other group received the same diet with probiotics added to the drinking water, which was changed daily, for seven days prior to the start of chronic psychological stress (probiotic diet) and continued to receive probiotics until the experiments were concluded. Both groups were provided access to food and water ad libitum.9,13 We have previously shown that probiotics survive and transiently colonise the gut when administered to mice via addition to sterile drinking water.8,9 Rats were weighed at the beginning of the experiments (day 0), after the probiotic pretreatment, and prior to the start of WAS (day 7), and at the conclusion of the study period (day 17). All procedures were approved by the Animal Care Committee at McMaster University. Four groups of rats were studied including: control (basal diet/sham stress), probiotic (probiotic diet/sham stress), stress (basal diet/WAS), and probiotic + stress (probiotic diet/WAS). Rats from both the basal and probiotic diet groups were subjected to either WAS or sham stress for one hour/day for 10 days, as previously described.13 Briefly, rats were weighed and then placed onto a platform (8×6 cm) affixed to the centre of a plastic container (56×50 cm) filled with warm water (25°C) to 1 cm below the platform. Rats subjected to sham stress were placed on the same platform in a container without water. Four hours after the last WAS or sham stress session, rats were killed by decapitation, and tissue—including mesenteric lymph nodes (MLN) and intestinal segments—were taken for bacterial translocation, and morphological and functional analysis, respectively. Detection of viable bacteria in MLN represents bacterial translocation from the lumen of the intestine.16 Lymph nodes from the ileocaecal and left colonic regions of each rat were removed aseptically and dissected free of fat. Nodes were then homogenised in sterile phosphate buffered saline or thioglycollate broth (1 ml) for culture of aerobic and anaerobic bacteria, respectively. A 0.1 ml aliquot of each homogenate was plated onto blood agar and incubated at 37°C, and the number of colonies counted on all plates. Bacterial translocation data are represented as medians and ranges of the total CFU (both aerobic and anaerobic) cultured from MLN of each rat after 48 hours of incubation. For light microscopy studies, tissues from at least four rats in each group (2–4 sections per rat) were examined. Full thickness sections of distal ileum and colon were excised, immediately fixed in neutral buffered formalin, embedded in paraffin, and processed for histology and immunohistochemistry analyses. 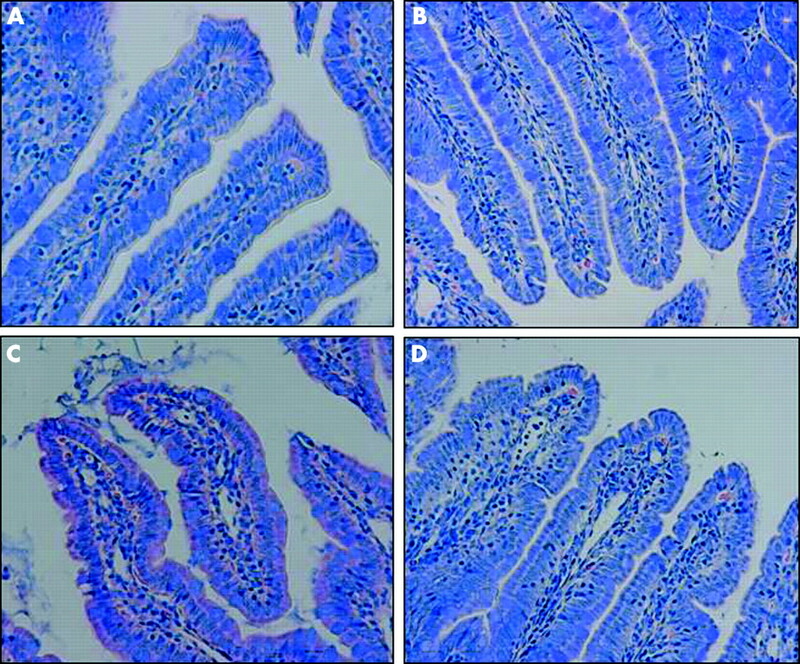 Coded sections of ileal and colonic tissues were stained with haematoxylin-eosin and assessed for the degree of mucosal hyperplasia. Epithelial thickness was measured by micrometry using a Leica NEWDM 4500BR microscope; at least 10 measurements from non-overlapping well oriented areas were taken from each sample and results expressed in micrometers.9 In addition, ileal and colonic sections were assessed for the severity of mucosal inflammation by a single blinded observer (B-YN) based on the following: infiltration of neutrophils and mononuclear cells into the lamina propria (0, scant-normal; 1, minimal to mild; 2, mild to moderate; 3, moderate to severe; 4, severe inflammation), degree of cryptitis (0–4), and submucosal inflammation (0–4).9 The presence of adherent bacteria was assessed in Giemsa stained tissue sections. Activation of caspase-3 was determined to quantify the degree of apoptosis in intestinal epithelium.17 Briefly, tissue sections were baked overnight at 60°C, dewaxed in xylene, and hydrated in distilled water through decreasing concentrations of ethanol. Utilising an autoimmunostainer (Ventana Medical Systems, Tucson, Arizona, USA), endogenous biotin was blocked and tissue sections were incubated with a rabbit antihuman CPP32 (caspase-3) antibody (Dakocytomation, Carpinteria, California, USA) at a dilution of 1 in 250, followed by a 1 in 100 dilution of biotinylated antirabbit IgG (Vector Laboratories, Burlington, Ontario, Canada) conjugated with Ventana iVIEW 3-3′-diaminobenzidine (Vector). Coded sections were counterstained with haematoxylin, and caspase-3 positive staining assessed under bright field microscopy. Tissues for transmission electron microscopy (TEM) were immediately fixed in 0.1 mol/l sodium cacodylate buffer (pH 7.4) containing 2.5% glutaraldehyde for two hours at room temperature, rinsed overnight (4°C) with 0.05 Tris buffer (pH 7.6), washed, and subsequently processed for TEM. Tissues from ileum and colon were cut into longitudinal sections and randomly chosen enterocytes and colonocytes were examined in defined areas of the apical region (above the nucleus) by a single blinded observer (P-C Y). In sections from the ileum, the region studied was the middle one third of the upper half of villi for all rats. The presence of bacteria and their relation to gut enterocytes (defined as bacteria in close contact or inside epithelial cells, associated with disappearance of microvilli, and/or condensation of the actin cytoskeleton) was assessed by TEM in sections from four animals in each of the four study groups. For the purposes of enumeration, randomly selected areas in at least eight ultrathin sections from the ileum and colon (two of each ileal and colonic sections/rat), covering a surface area equivalent to 276–335 grid segments, were examined. The number of adherent bacteria is reported per mm2 of surface area, calculated based on the total number of grid segments evaluated in each group. Distal ileum and colonic segments were immediately immersed in oxygenated Kreb’s buffer, stripped of external muscle and myenteric plexus, and adjacent segments mounted into Ussing chambers (World Precision Instruments; Narco Scientific, Mississauga, Ontario, Canada). The chamber exposed 0.6 cm2 of tissue surface area to 8 ml of circulating oxygenated Kreb’s buffer at 37°C. The buffer contained (in mM): 115 NaCl, 1.25 CaCl2, 1.2 MgCl2, 2.0 KH2PO4, and 25 NaHCO3 (pH 7.35). The serosal buffer also contained 10 mM glucose as an energy source that was osmotically balanced by 10 mM manitol in the mucosal buffer.17 The chambers contained agar-salt bridges to monitor the potential difference across the tissue and to inject the required short circuit current (Isc) to maintain a zero potential difference, as registered via an automated voltage clamp (World Precision Instruments, Sarasota, Florida, USA). Tissue conductance, representing passive permeability to ions, was calculated by Ohm’s law. Baseline values for Isc, indicating net ion secretion, and conductance, as an inverse measure of tissue resistance, were recorded at equilibrium, 20 minutes after mounting of the intestinal segments. Mucosal to serosal transport of macromolecules was assessed by measuring transepithelial flux of horseradish peroxidase (HRP), used as a model protein antigen. Fifteen minutes after mounting the tissues, HRP (type VI; Sigma-Aldrich Co, St Louis, Missouri, USA) was added to the luminal buffer at a final concentration of 10−5 mol/l. Serosal samples (0.5 ml) were obtained at 30 minute intervals for two hours. HRP activity was determined by a modified Worthington method, as previously described,18 and mucosal to serosal fluxes of HRP expressed as pmol/h/cm2. Results are expressed as mean (SEM). One way analysis of variance (ANOVA) was used with Neuman-Keuls as a multiple comparison test. Bacteria-epithelial cell interactions and bacterial translocation data were compared using a χ2 test. A p value <0.05 was considered significant. N values represent the number of rats studied in each test group. All rats receiving probiotics remained healthy throughout the study. There were no signs of diarrhoea, weight loss, or loss of appetite. Animal weight increased continuously in the rats subjected to sham stress, or remained relatively constant in rats exposed to WAS. Absence of normal weight gain in animals exposed to WAS was not affected by probiotic treatment. Differences in weight gain or loss among the treated groups did not reach statistical significance (data not shown). Light microscopy photomicrographs with Giemsa staining revealed that there was close interaction between luminal bacteria and the apical aspect of surface ileal enterocytes in rats subjected to WAS (fig 1C). Bacterial interactions with ileal enterocytes were not observed in sham stressed animals (fig 1A, B). Pretreatment with probiotics prevented the bacteria-epithelial cell contacts induced by WAS (fig 1D). Comparable findings were observed in the large intestine (data not shown). Effects of probiotics on interactions of bacteria with gut epithelial cells. Rats from both basal (control) and probiotic treated groups were subjected to either water avoidance stress (WAS) or sham stress for 10 days, for one hour/day. Representative photomicrographs of Giemsa stained sections of ileum mucosa show normal ileal mucosa from control (A) and probiotic treated (B) rats with sham stress. (C) Ileal mucosa in rats subjected to WAS demonstrated a large number of bacteria in contact with the apical surface of the epithelium. (D) Ileal mucosa in probiotic + WAS rats; no bacteria were observed in contact with the epithelium. Minimum of four rats per group, 2–4 sections/rat. Approximate original magnifications ×400. TEM confirmed the findings demonstrated with light microscopy. 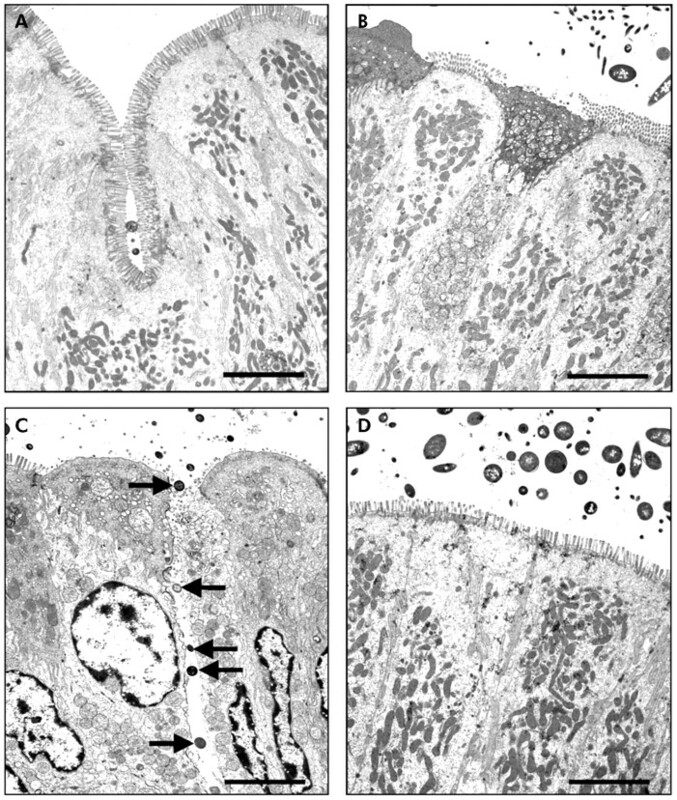 While there were no bacteria adhering to the apical surface of enterocytes in sham stressed rats (fig 2A, B), multiple bacteria were shown closely adhering and internalised into ileal enterocytes in stressed rats (fig 2C, arrows). Electron dense condensation around the internalised bacteria (fig 2C, arrowheads), consistent with polymerised actin,19 indicates that enterocytes underwent cytoskeletal rearrangements. Pretreatment with probiotics prevented WAS induced bacteria-epithelial cell interactions (fig 2D). Evidence of close contact between luminal bacteria and epithelial cells was also identified in the colon of stressed rats (fig 3C, arrows) whereas such findings were not observed in either probiotic treated rats (fig 3D) or in any of the sham stressed animals (fig 3A, B). The number of adherent bacteria in randomly selected areas of at least eight ultrathin sections per study group is summarised in table 1. Adherent bacteria were reduced in both ileal and colonic tissues obtained from rats provided with probiotics in drinking water and subjected to WAS (p<0.05). Effect of probiotics on bacterial adherence to ileal epithelial cells. Rats from both basal (control) and probiotic groups were subjected to either water avoidance stress (WAS) or sham stress for 10 days, for one hour/day. Representative transmission electron photomicrographs (taken from eight ultrathin sections/group) showing the apical region of ileal enterocytes in rats from control (A), probiotic (B), WAS (C), and probiotic + WAS (D) study groups. Unlike rats treated with probiotics prior to WAS (D), in many sections from rats subjected to WAS (C) luminal bacteria were observed in close proximity to the epithelium, reflecting bacterial adherence and, in some cases, bacterial internalisation (arrows); also noted were pronounced condensation of the epithelial cytoskeleton surrounding internalised bacteria (arrowheads). Approximate original magnifications, ×4000. Effect of probiotics on bacterial adherence to colonic epithelial cells. Rats from both basal (control) and probiotic groups were subjected to either water avoidance stress (WAS) or sham stress for 10 days, for one hour/day. 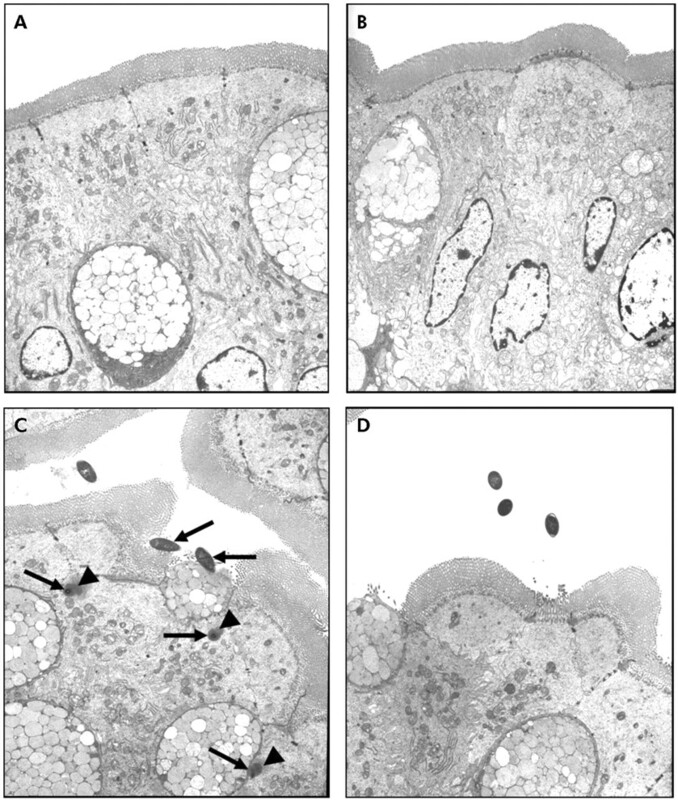 Representative transmission electron photomicrographs (taken from eight ultrathin sections/group) showing the apical region of colonic enterocytes in rats from control (A), probiotic (B), WAS (C), and probiotic + WAS (D) study groups. Unlike rats treated with probiotics prior to WAS (D), in many sections from rats subjected to WAS (C) luminal bacteria were observed in close proximity to the epithelium, reflecting bacterial adherence; bacteria were also present in intercellular spaces (arrows). Bars = 5 µm. To determine if bacteria penetrating into the gut epithelium translocated to MLN, homogenates of ileocaecal and left colonic lymph nodes from all groups were cultured. MLN were sterile in both sham stress groups while WAS caused bacterial translocation. Probiotic therapy completely abrogated bacterial translocation to mesenteric lymph nodes following WAS (table 2). Intestinal tissue segments stained with haematoxylin-eosin examined by light microscopy demonstrated normal morphology in all animals. No apparent differences were found between rats from the four study groups and none of the ileal or colonic tissue segments exhibited evidence of epithelial cell hyperplasia (fig 4). Chronic WAS had no substantial effect on inflammatory cell infiltration into the lamina propria and there were no histological indications of submucosal inflammation in stressed rats (data not shown). Immunohistochemical analysis of caspase-3 positive cells in ileal and colonic mucosa segments in each of the four study groups showed that the number of apoptotic epithelial cells remained unchanged (data not shown). Effect of probiotic treatment on intestinal epithelial hyperplasia. Rats from both basal (control) and probiotic diet groups were subjected to either water avoidance stress (WAS) or sham stress for 10 days, for one hour/day. 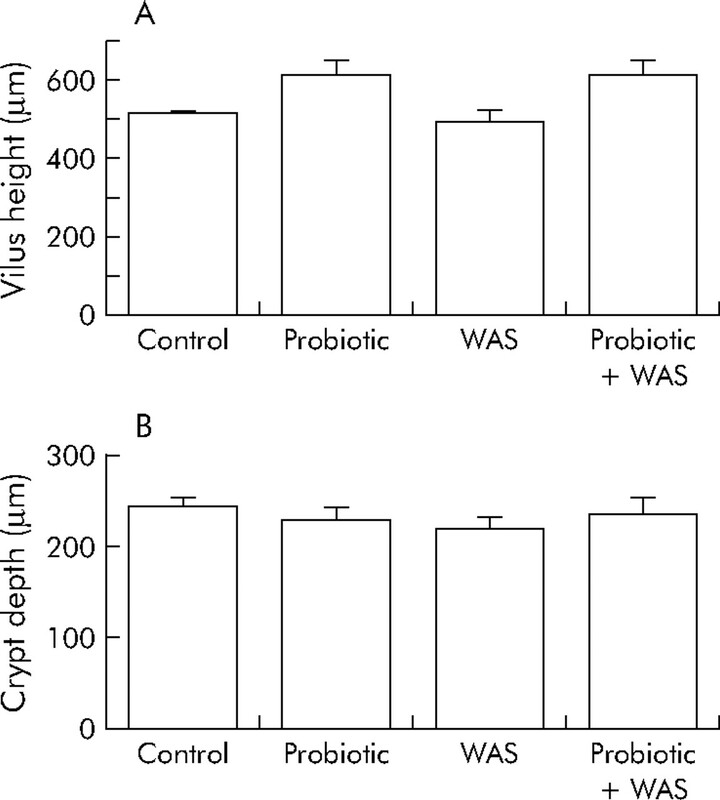 Quantitative analysis of villus height (A) and crypt depth (B) in rats from control, probiotic, WAS, and probiotic + WAS study groups. Epithelial cell hyperplasia was not observed in either ileum or colon tissues obtained from all four groups of rats (minimum four rats/group, 2–4 sections/rat). Results are presented as mean (SEM); ANOVA p>0.05. Rats exposed to chronic stress showed an increase in baseline Isc and conductance in both the ileum and colon (fig 5A–D). Pretreatment with Lactobacillus species markedly attenuated the chronic stress induced increases in baseline Isc in the ileum but not in the colon (fig 5A, B). In contrast, there were no inhibitory effects of probiotics on stress induced elevations in tissue conductance (fig 5C, D). Treatment with probiotics did not affect the increase in macromolecular permeability (HRP flux) in either the ileum or colon of rats exposed to chronic WAS (fig 5E, F). Effect of probiotics on intestinal ion secretion and barrier function. Rats from both basal (control) and probiotic diet groups were subjected to either water avoidance stress (WAS) or sham stress for 10 days, for one hour/day. Four hours after the final stress or sham stress session, intestinal segments were mounted into Ussing chambers. Left panels: ileum: (A) baseline short circuit current (Isc); (C) electrical conductance (G); and (E) flux of horseradish peroxidase (HRP). Right panels: colon: (B) baseline Isc; (D) electrical conductance (G); and (F) flux of HRP. Values are mean (SEM); n = 4–8 rats/group, 2–4 tissue sections/rat. Comparisons were performed using ANOVA. Probiotic therapy is increasingly used in the treatment of a variety of gastrointestinal diseases and chronic inflammatory conditions of the gut.1 The present study shows beneficial effects of probiotic administration in chronic stress induced intestinal epithelial barrier dysfunction. Treatment with live probiotics—Lactobacillus rhamnosus, strain R0011 and Lactobacillus helveticus, strain R0052 (Lacidofil)—reduced luminal bacterial adherence and translocation to the MLN of rats following chronic WAS. Animals were provided free access to probiotics in sterile drinking water and remained healthy throughout the 17 day study protocol. Provision of probiotics in sterile drinking water offers the benefits of ease of administration of such treatment compared with bolus orogastric gavage.20 This method of administration was also utilised to maintain a constant supply of live lactobacilli, which are able to transiently colonise the bowel.9 The commercially available mixture of live probiotics used in this study has been used by us previously to demonstrate effectiveness in the reduction of both bacterial attachment and colonisation, and reduction of bacterial induced mucosal inflammation in other rodent models of infectious gastrointestinal disorders.8,9 Eutamene and colleagues21 have also reported the beneficial effects of this combination of probiotics in preventing visceral hypersensitivity and increased colonic paracellular permeability, as measured by fluxes of 51Cr-EDTA, in rats subjected to acute restraint stress. Adherence to intestinal epithelial cells is a first step for colonisation and penetration of bacteria.24 Consequently, limiting access of bacteria to the apical surface of epithelial cells lining the gastrointestinal tract is important for host survival. Probiotics transiently colonise the gut and competitively exclude pathogenic bacteria from binding to the intestinal epithelium.25 The current study shows that probiotic therapy prevents adhesion of luminal bacteria to the surface of the epithelium induced by chronic psychological stress in rats. Competitive exclusion, however, is probably not the only explanation for these findings as probiotics reduced the absolute number of adherent bacteria on intestinal epithelium. In previous studies examining the effects of chronic psychological stress on gut function, we demonstrated adherence of luminal bacteria to the apical surface of enterocytes in both the ileum and colon, as well as internalisation of some microbes into the epithelium, both of which were mast cell dependent.13 In addition, there is evidence suggesting that probiotics interact with indigenous bacteria and host immune cells to modulate mucosal inflammatory processes.26 It remains to be determined however if probiotics prevent stress induced bacterial attachment and translocation via interaction with mucosal mast cells and altering host immune responses. The precise mechanism(s) by which probiotics maintain intestinal barrier integrity, thereby eliminating bacterial translocation to MLN in rats subjected to WAS, is currently unknown. Velin and colleagues14 reported that chronic stress modulates the barrier function of the follicle associated epithelium, thereby allowing enhanced uptake of normally non-invasive luminal bacteria. Therefore, it is possible that probiotics could elicit their beneficial effects via a reduction in antigen uptake through Peyer’s patches. With the exception of ileal baseline Isc, in the present study probiotic treatment had no demonstrable effect on enhanced epithelial conductance (representing passive permeability to ions) and elevated permeability to macromolecules in rats subjected to chronic stress. Similar to Michail and Abernathy,28 this study shows that pretreatment with probiotics inhibits an increase in short circuit current caused by epithelial cell damage, even though there was no identifiable cell damage observed in our study. In conclusion, we have shown that administration of Lactobacillus species to a naïve host undergoing chronic psychological stress enhances mucosal defence against luminal bacteria, by preventing bacterial adherence to the epithelial cell surface and eliminating bacterial translocation. Enhanced bacterial uptake following exposure to chronic stress may lead to an increased antigen load in the intestinal mucosa. Thus local inflammation could be initiated, which eventually leads to more diffuse intestinal inflammation. This scenario could well have implications for the observed influence of chronic stress in humans with IBD. In addition, these findings indicate that probiotics may provide a novel approach for the management of stress induced intestinal dysfunction. More in depth studies into the mechanisms of action will allow a better understanding of how probiotics target specific organs in different disease states. This study was supported by a Program Grant from the Crohn’s and Colitis Foundation of Canada (CCFC) and the Canadian Institutes of Health Research (CIHR). MZ was the recipient of Fellowship Awards from the Hospital for Sick Children (Restracomp) and the CIHR-Industry (Canadian Association of Gastroenterology/Ferring Pharmaceuticals, Canada). PMS is the recipient of a Canada Research Chair in Gastrointestinal Disease. Reid G, Jass J, Sebulsky MT, et al. Potential uses of probiotics in clinical practice. Clin Microbiol Rev2003;16:658–72. Abbott A. Gut reaction. Nature2004;427:284–6. Ishibashi N, Yamazaki A. Probiotics and safety. Am J Clin Nutr2001;73:S465–70. Fedorak RN, Madsen KL. Probiotics and the management of inflammatory bowel disease. Inflamm Bowel Dis2004;10:286–99. Sartor RB. Probiotic therapy of intestinal inflammation and infections. Curr Opin Gastroenterol2005;21:44–50. Van Niel CW, Feudtner C, Garrison MM, et al. Lactobacillus therapy for acute infectious diarrhea in children: a meta-analysis. Pediatrics2002;109:678–84. Johnson-Henry KC, Mitchel DJ, Avitzur Y, et al. Probiotics reduce bacterial colonization and gastric inflammation in H. pylori-infected mice. Dig Dis Sci2004;49:1095–102. Johnson-Henry KC, Nadjafi M, Avitzur Y, et al. Amelioration of the effcts of Citrobacter rodentium infection in mice by pretreatment with probiotics. J Infect Dis2005;191:2106–17. Collins SM. Stress and the gastrointestinal tract IV. Modulation of intestinal inflammation by stress: basic mechanisms and clinical relevance, Am J Physiol Gastrointest Liver Physiol2001;280:G315–18. Soderholm JD, Perdue MH. Stress and the gastrointestinal tract II. Stress and intestinal barrier function. Am J Physiol Gastrointest Liver Physiol2001;280:G7–13. Velin AK, Ericson A-C, Braaf Y, et al. Increased antigen and bacterial uptake in follicle associated epithelium induced by chronic psychological stress in rats. Gut2004;53:494–500. Brades S, Schwetz I, Ennes HS, et al. Repeated exposure to water avoidance stress in rats: a new model for sustained visceral hyperalgesia. Am J Physiol2005;289:G42–53. Berg RD. Bacterial translocation from the gastrointestinal tract. Trends Microbiol1995;3:149–54. Van Grieken NC, Meijer GA, zur Hausen A, et al. Increased apoptosis in gastric mucosa adjacent to intestinal metaplasia. J Clin Pathol2003;56:358–61. Kiliaan AJ, Saunders PR, Bijlsma PB, et al. Stress stimulates transepithelial macromolecular uptake in rat jejunum. Am J Physiol1998;275:G1037–44. Knutton S, Baldwin T, Williams PH, et al. Actin accumulation at sites of bacterial adhesion to tissue culture cells: basis of a new diagnostic test for enteropathogenic and enterohemorrhagic Escherichia coli. Infect Immun1989;57:1290–8. Mangell P, Nejdfors P, Wang M, et al. Lactobacillus plantarum 299v inhibits Escherichia coli-induced intestinal permeability. Dig Dis Sci2002;47:511–16. Eutamene H, Chabo C, Guggisberg S, et al. The probiotic formulation Lacidofil/Entercine prevents stress-induced increase in colonic permeability and sensitivity to distension in rats. Presented at the 20th International Symposium on Neurogastroenterology and Motility, Toulouse, France, July 2005: abstract P180,. Yang PC, Jury J, Soderholm JD, et al. Chronic psychological stress in rats induces intestinal sensitization to luminal antigens. Am J Pathol2006;168:104–14. Lu L, Walker WA. Pathologic and physiologic interactions of bacteria with the gastrointestinal epithelium. Am J Clin Nutr2001;73:1124–30S. Resta-Lenert S, Barret K. Live probiotics protect intestinal epithelial cells form the effects of infection with enteroinvasive Escherichia coli. Gut2003;52:988–97. Thompson-Chagoyan OC, Maldonado J, Gil A. Aetiology of inflammatory bowel disease: Role of intestinal microbiota and gut-associated lymphoid tissue immune response. Clin Nutr2005;24:339–52. Luyer MD, Buurman WA, Hadfoune M, et al. Strain-specific effects of probiotics on gut barrier integrity following hemorrhagic shock. Infect Immun2005;73:3686–92. Michail S, Abernathy F. Lactobacillus plantarum reduces the in vitro secretory response of intestinal epithelial cells to enteropathogenic Escherichia coli infection. J Pediatr Gastroenterol Nutr2002;35:350–5. Ouwehand AC, Salminen S, Roberts PJ, et al. Disease-dependent adhesion of lactic acid bacteria to the human intestinal mucosa. Clin Diagn Lab Immunol2003;10:643–6. Gut 2006; 55 1529a-1529a Published Online First: 17 Oct 2006.